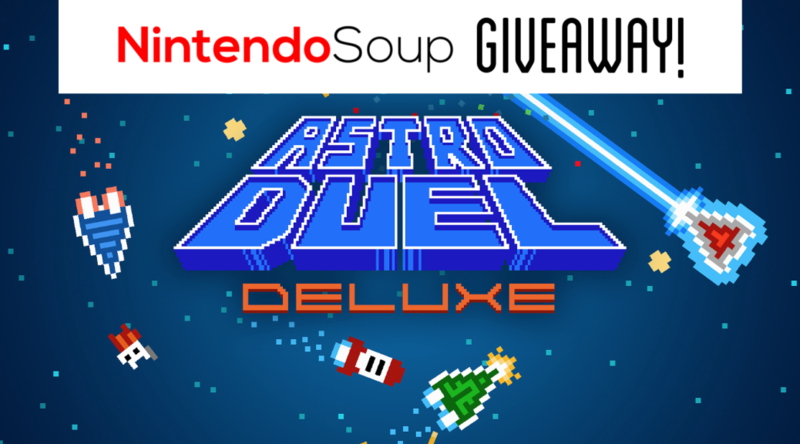 NintendoSoup Giveaway: Astro Duel Deluxe! UPDATE – The giveaway has come to an end. Thank you for participating! Hey everyone! We’re pleased to announce our very first giveaway in collaboration with Panic Button Games, the developers of Astro Duel Deluxe! Astro Duel Deluxe is a local multiplayer game for Nintendo Switch, where up to 6 players can enjoy blasting each other’s ships in space…. and then run over their pilots. Our review editor Nitro has given the game a shot with his friends, you can check out what he has to say here. For this giveaway, we have a North American and European digital code up for grabs, so we will have 1 lucky winner coming from each region. There are three ways to enter the giveaway – Facebook, Twitter, and Youtube. If you would like to increase your chances of winning, you can enter in all three! The giveaway ends on June 28, 2017 at 9:00am Pacific Time. We will announce the two lucky winners the day after it ends. Good luck everyone – and happy blasting! Game Review: Astro Duel Deluxe Review + Surprise!